Emma Bradbury and The Crown Jewels. - Design Inspiration. 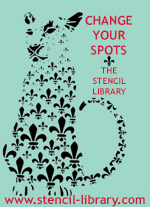 Planet Stencil Library. Emma Bradbury and The Crown Jewels. It seems ages since I was last able to bring you a Crown Jewels stencil design winner but I am pleased to intoroduce you to Emma Bradbury and her Folk Birds stencil. I am excited by Emmas stencil design. I am also excited by the fabulous knitwear that she designs. The Crown Jewels stencil design competition was created by Crown Paint and The Royal College of Art. Emma is a recent graduate of the RCA’s MA in Constructed Textiles. Her stencil was inspired by Polish Wycinaki paper cuts and how traditionally, polish homemakers used to decorate their domestic living spaces with symmetrical paper cut patterns featuring symbols of everyday rural life, such as birds, animals and flowers. Emma let me see her look book and design inspiration for the Folk Birds stencil. I LOVE the oversized stencil as a bedhead in black... although the smaller design is probably more useful. As an alternative one can keep adding repeats of the smaller, squarer design. The stencils have a handmade aesthetic and a refreshingly folksy vibe. Emma is really making a name for herself with knitted fashion and craft, check out her website for news, pics and the chance to buy. I hope to set my next work placement students onto decorating with the newest stencils from the Crown Collection, I would like to see Folk Birds stencilled with scarlet onto white walls. I was inspired by a red and white quilt that appeared in the film Mama Mia. If we get this done I will of course show you the pictures. Emmas stencil and all the previous Crown/RCA stencils are available fromThe Stencil Library. I love the way these designs have been used, especially the overscaled one over the bed. Done very simply, in one color, it gives the feel of a large scale block print!